As our summer boating voyage through The Netherlands nears its conclusion, and we wave goodbye to our delightful guests, the logistics of making our safe return back to England begin to be of concern. Today was an abortive trip from Amsterdam Marina to Zanstaad but still we managed to fill Lady Martina’s diesel tanks and obtain a good mooring at Sixhaven on our return to chalk off two of the action items to make it a better day. The scheme was to get away from the exposed expanse of Amsterdam Marina and all the building noise and spend a day or two in nearby venues and so I planned a short trip along the Noordzeekanaal to Zijkanaal G, where I knew that there was a bunker boat and I thought that we could then lock through Wilhelmina Sluis, pass under the Beatrixbrug and take advantage of the leisure boat moorings just the other side. We would thus be situated to see Zaandam and perhaps cruise further to the Zaanstad area to see the windmills and all else. The plan for the following day was then to cruise back to Sixhaven to be well positioned for our ferry and flight arrangements. This scheme nearly worked as first we arrived in Zijkanaal C, found the bunker boat and started to fill up with diesel. I had negotiated a deal of 600 litres for €600, having grossly over-estimated how much we wanted but we only needed just under 260 litres and so I had to buy these at €1.25/litre, there normal price. I need not have felt disappointed as it meant that there was a lot less to pay! 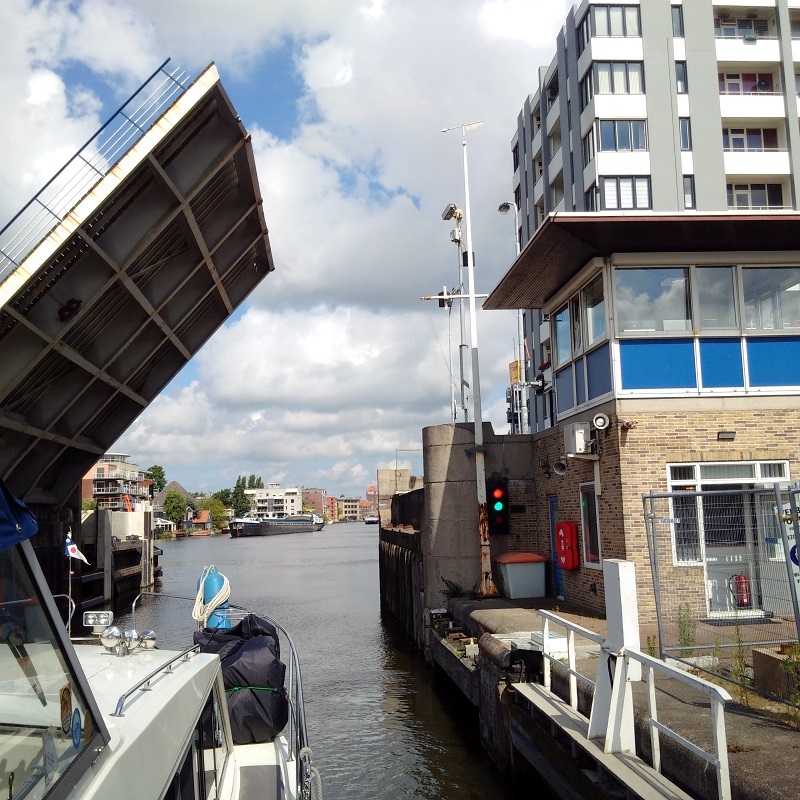 Next, we cruised under the Dr.J.M.den Uylbrug bridge without needing it to swing and approached the Sluis en Wilhelmina and experienced a manageable delay as the sluis watcher waited for a large cargo vessel to come up from behind us. The other motor boat made for the shore, but we circled, came up behind the vessel and then followed it into the sluis; taking the forward place alongside it; in position to be the first boat to leave. We then found a place at the mooring above the sluis but then became concerned as we were the wrong side of a dividing line demarking the space that could be occupied free for 72 hours and that reserved for boats waiting for the sluis. 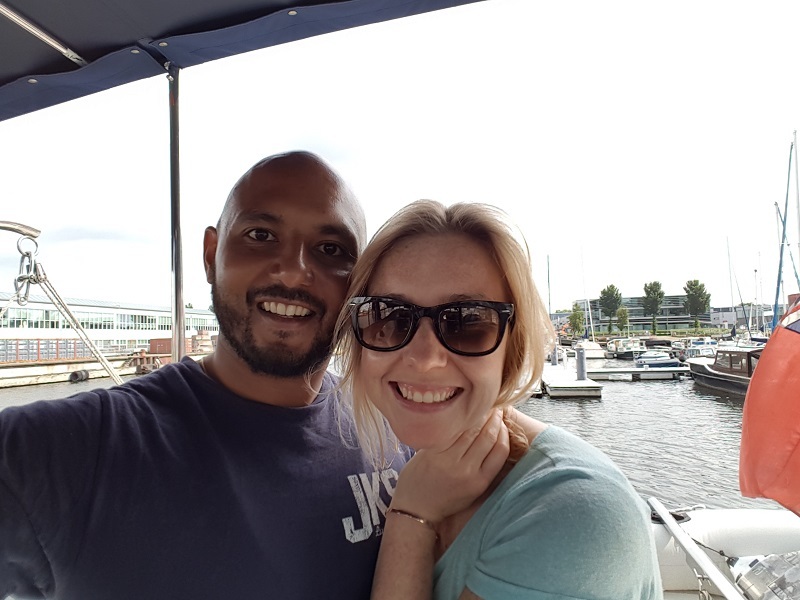 We were then reminded of the differences of Dutch culture as the crew of the boat behind us assured us that it did not matter and that nobody ever checked but I was uncomfortable with that and tried to get Lady Martina into the right place. I very nearly did so but just required that boat to move up a bit when they refused saying that ‘we were transferring the problem to them’ by edging them into the bridge waiting zone. From a position of saying that it did not matter when we were going to moor there, they were now saying that it did matter for them! I should have accepted their next offer, which was to move further down into the 72 hour moorings, so we could more mostly in the right place but by then I was frustrated at this turncoat attitude and we left, seeking moorings further up the canal. My experience at the next bridge, Pr Bernhardbrug was not very encouraging as they (eventually!) responded to my VHF call with a complicated Dutch sentence that I could not understand and left us waiting on single red lights. I got fed up with this again and turned back, making my way back down Zijkanaal G and turning East along the Noordzeekanaal towards Amsterdam. We were reconciled to having to return to Amsterdam Marina again but I thought that I would just try Sixhaven Marina once more. The sounded encouraging on the phone and then, upon entry, there were at least three places into which Lady Martina would fit. So, out of such adversity, we had landed on our feet and could moor at our preferred venue ready for our time in England. 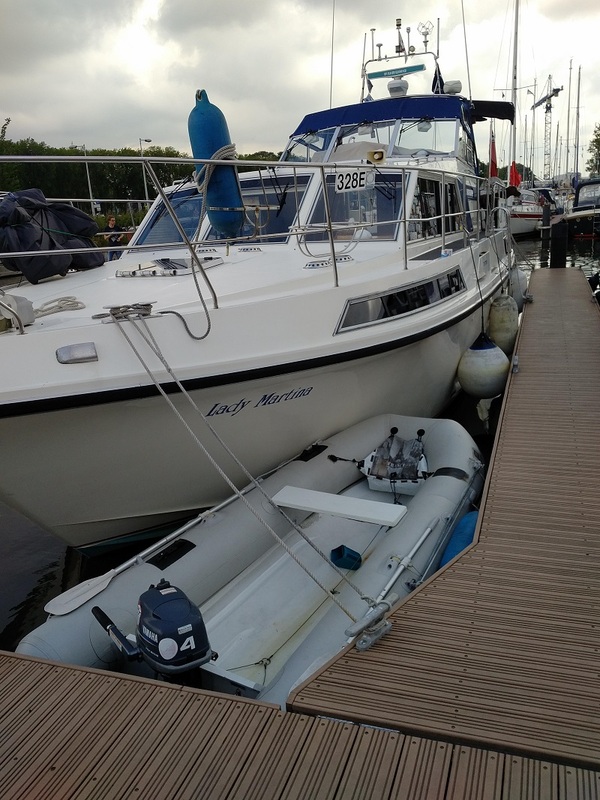 The only problem was that, once they fill up the normal moorings, they then let larger vessels moor stern-on against the main pontoon in between and my davits and dinghy were supposedly in the way. I had just set off with the dog for his run, when the harbour-master stopped me and wanted me to drop the dinghy off of the davits and retract them so that we would be contained within our box. I did this and brought the dinghy round to the bow where, after I had walked Max, Kathleen and I then started using the dinghy to clean Lady Martina’s hull.